I must have been 17 years old when I bought this vintage skirt at the flea market. 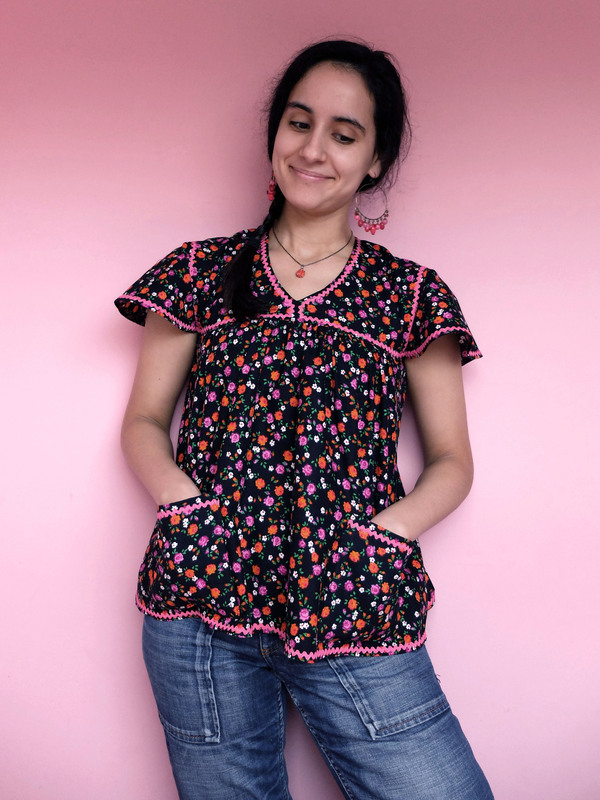 It was the perfect hippie skirt, romantically grazing the floor with each step, and I adored its floral print, which reminded me of several Kabyle dresses my mother had passed on to me. Flash forward a few years later, the skirt didn’t fit anymore, and I thought it would be nice to remake it into something else, such as a Kabyle dress, or more likely a blouse, depending on the amount of usable fabric. The only problem was, I was just a beginner sewer at the time and I didn’t feel up to the task yet, fearing to waste what felt like particularly precious fabric. 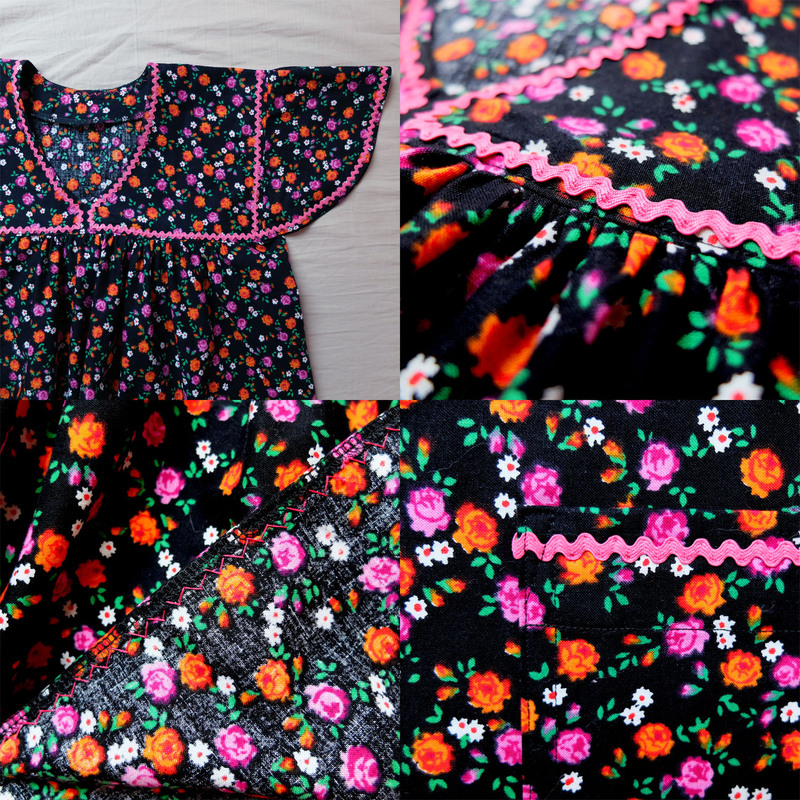 So I unpicked the skirt, and I put the pieces at the bottom of my budding refashion pile. When Thread&Needles announced a sewing contest around the theme of travel, I immediately thought of that old project of mine, thinking about my travel to Algeria when I was a little kid: I had gone with my brother to meet our family and discover the country, and I had been given the cutest little pink custom made Kabyle dress, which I had kept long after it had become too small, and later replaced with my mother’s floral print dresses. I drafted my own pattern, i.e. I copied the dress that fits me best and just changed the underarm area a little bit so that I could wear the blouse without a tank underneath, and drafted a neckline facing instead of adding a self fabric yoke lining as in the dress I copied. 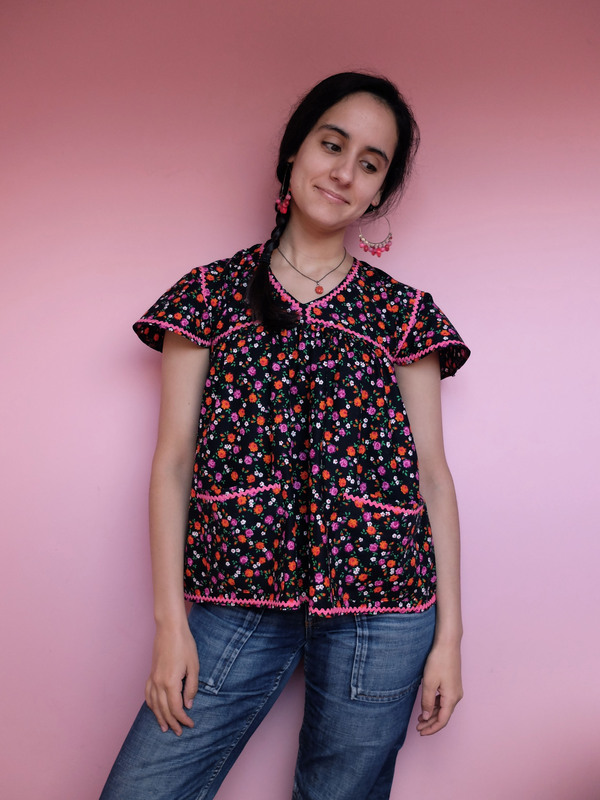 I chose to make a blouse and not a dress both because I didn’t have enough fabric and because I liked the idea of a more casual version, worn with jeans or shorts in summer. I thought about adding the patch pockets because I had just enough fabric left that I didn’t want to waste, and I must say I think they look quite nice and they are also pretty useful! I was afraid the blouse would be too short (due to fabric restraints), so I was also relieved when I tried it on and saw that it looked exactly how I had pictured it. 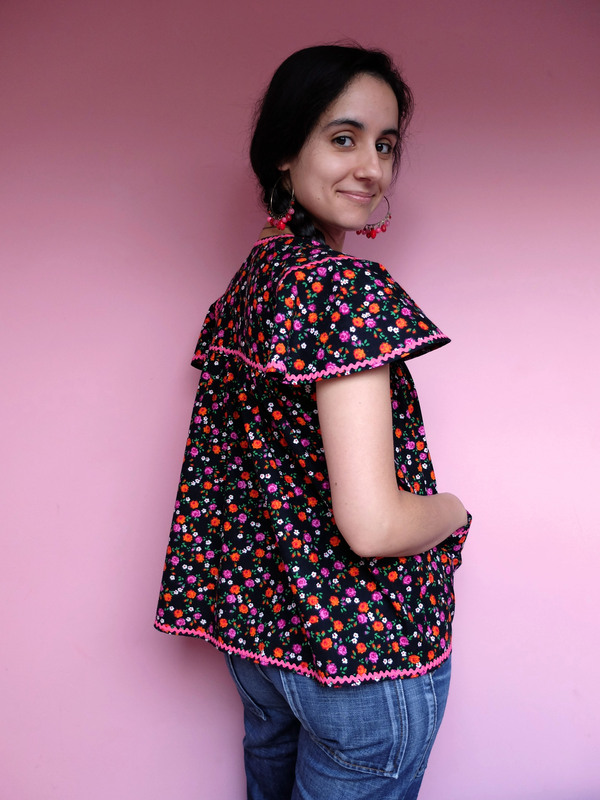 Dare I say, even better, with the addition of the cute little patch pockets!